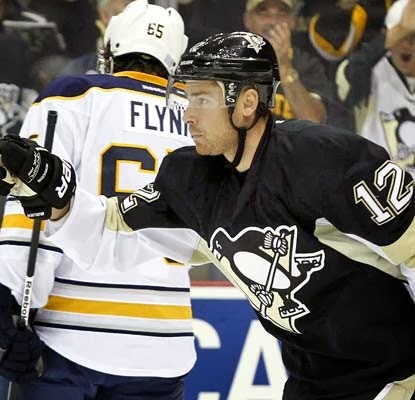 The Pittsburgh Penguins continued to show their defensive skills during their win over Buffalo 4-1 on Saturday. Sidney Crosby and Chuck Kobasew both scored in the first, Chris Kunitz added a penalty shot in the third and Craig Adams scored his second goal of the season on an empty netter late in the third. At this point Crosby, Kobasew, and Adams are all on pace for 82-goal seasons. If you enjoy making fun of the Philadelphia Flyers as much as us you'll know that the Flyers are on now 0-2 and Claude Giroux is on pace for a zero point season. The Sabres backup goalie Jhonas Enroth got the start Saturday as a result of an injury to Ryan Miller and stopped 31 shots. Enroth was arguably one of the best players on the ice. At times we felt bad for him because he was playing so well behind a team that was playing so bad. The Penguins, on the other hand, only allowed 14 shots through two periods (five in the second) and are really displaying a new sense of responsibility in their own zone. It seems the team has traded in their usual glitzy offense for a more careful approach. Once again Robert Bortuzzo and Olli Maatta looked really good, Maatta even getting compared to Sergei Gonchar by one of our blogging friends, Jesse Marshall of Faceoff-Factor. Fleury, was brilliant for the second straight game, going 1:15:06 without allowing a goal, the longest shutout streak for the beginning of the year in franchise history. 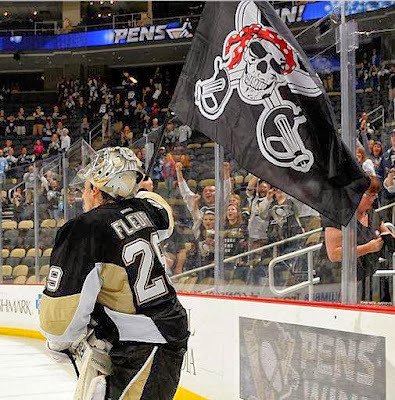 Fleury previously held the record with 66:00 in 2006-07. So far Fleury has stopped 47 out of 48 of the shots he face this season and leads the NHL in save percentage. The Penguins showed a lot of discipline up front by the net blocking the puck on multiple occasions but it is Fleury that has looked confident and poised while playing. Bylsma summed it up best stating: "When it has been difficult, there have been breakdowns or chances, [Fleury] has been up to the task and has been really solid." The Penguins have opened up 2-0 for the third straight season and will try to make it 3-0 on Tuesday at 7:00 PM against the Hurricanes at CONSOL.